For a more meditative adventure, don a pair of snowshoes and explore the countless snow-covered trails in the area or head out on a guided experience. Snowshoeing will get you up close and personal with the winter flora and fauna of the Aspen area. Aspen Trail Finder provides maps, trails, and conditions for snowshoeing in the valley. AAG is a professional mountain guide service that has been operating year-round in the Aspen area since 1987. Private and group trips include hiking, rock climbing, winter and summer mountaineering, peak ascents, snowshoeing, backcountry skiing, mountain biking, backpacking and hut trips. Explore Aspen with ACES! 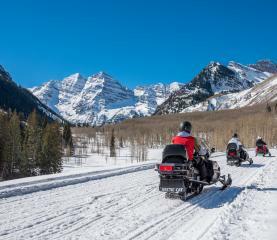 Daily guided snowshoe tours explore popular areas like Aspen and Snowmass mountains and Ashcroft Ghost Town. Or, hire a guide for private, build-your own experiences with our certified interpretive Naturalist guides. Snowshoes provided, no experience necessary.